A review of current IT budgets shows that most major systems investments are already deeply entrenched in old technologies. 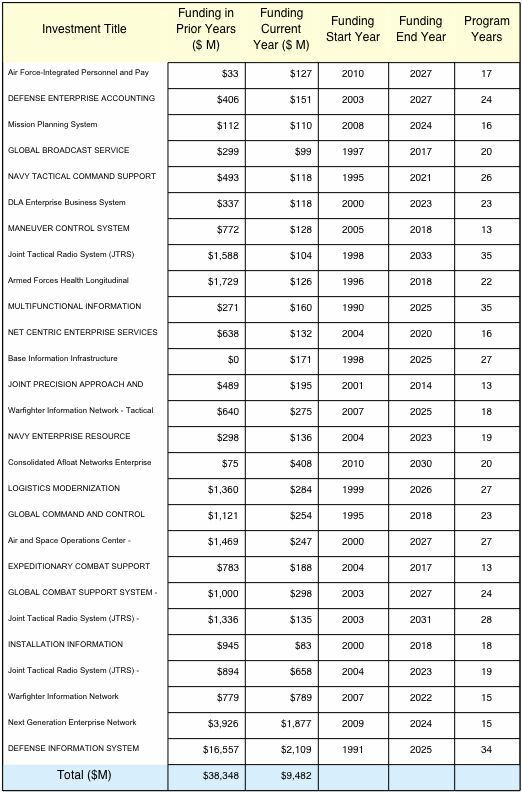 (1) An examination of 27 major DoD systems with current spending of $9.5 billion (or 25% of total FY12 spending) shows that program investments will have a life of 13 to 35 years. So far $38.3 billion has been spent on these programs, with total expected spending to be well of $100 billions. Any migration to cloud computing, such as converting to a shared infrastructure would require a major overhaul of software while its installation is well on its way. The problem is that each of these programs has been conceived at a time when infrastructure and data interoperability were not in place. The prospects of achieving that while the programs are well on their way are not good. The program budgets are individually locked into spending projections that leave no funds available for starting migration towards systems that would be compatible at the enterprise level. Confronted with the prospects of achieving major savings through cloud computing methods the DoD is now presented with what appears to be an overwhelming obstacle hot to migrate to cloud computing while keeping on schedule for its major programs. One of the possible options is to save money through curtailment of service-specific programs so that they can perform enterprise functions instead. Acceleration of program completion dates through a gradual substitution of enterprise level cloud features would be one of the options how to speed up the extrication from legacy systems.